Brinjal – the “King of Vegetables” happens to be an all time favorite of Indians. Brinjal or Aubergine or Eggplant (Vazhuthananga in Malayalam) comes in different shapes, sizes and colors. It can be long and slender or small and round. It can be dark purple in color, white, yellow or light green. I never had an affinity for Brinjal but my liking for it started when my Mother In Law made a dish using long green Brinjals and dried shrimp. 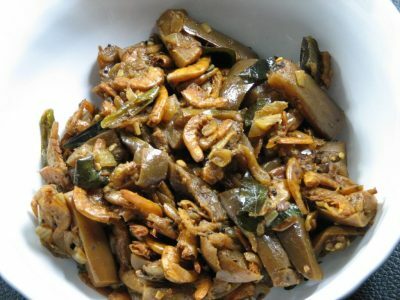 Brinjal and Dried Shrimp Thoran (traditional Kerala vegetable saute with coconut scrapes) is an excellent dish. I have started falling in love with Brinjal after trying out different recipes like Vazhuthananga Thoran, Mezhkkuperatti, Stuffed Brinjal and so on. I managed to prepare a stir fry using dried shrimp (Unakka Chemmeen) and long violet Brinjals and it tasted great. I didn’t add coconut to it, so I prefer to call the dish as Brinjal Dried Shrimp Mezhkkupuratti – Vazhuthananga Unakka Chemmeen Mezhkkupuratti. This recipe is dedicated to my dearest Husband who has always inspired and encouraged me. 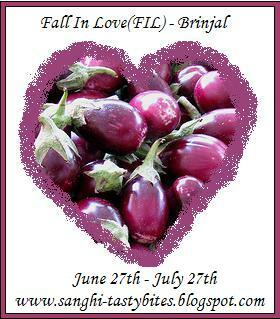 I am sending this to Fall in Love FIL – Brinjal, event hosted by Sanghi’s Food Delights. Wash and clean the dried shrimps. Transfer the shrimps to a pan. Cover with very little water – around 1/2 cup. Add a pinch of turmeric, salt, kudampuli, 1/2 tsp chilly powder, 1/2 tsp fish masala powder, 1 tsp coriander powder and cook the shrimps for 15-20 minutes till tender. Drain the water from the cooked shrimps. Reserve the water and the kudampuli. Meanwhile, heat oil in a kadai and splutter mustard seeds. Add onions and saute till translucent. Add green chillies, curry leaves and garlic and saute for a few minutes. Add 1 tsp chilly powder, 1/2 tsp turmeric, 1/2 tsp garam masala powder and stir fry for a minute. Next add the brinjal pieces to the kadai. Sprinkle salt and mix everything. Cover and cook for 5 minutes on medium flame. Add the kudampuli pieces and the reserved gravy to the kadai. Cover and continue to cook for another 10-15 minutes until the brinjal pieces are almost cooked. Add the cooked shrimp and cook for another 5 minutes. Remove the lid and stir fry for another 2-3 minutes till the water has evaporated. Thats an interesting dish and looks so…. yummy! Wow.. Cool site.. yummy delights! Thanks for the lovely entries Jisha! Thank you Jisha for your delicious oats puttu.